The commissioners also resisted the efforts of BOC Chairman Melvin Davis to expand the service area for alcoholic sales beyond what has been allowed for the sales of beer and wine in restaurants. The commissioners also asked County Clerk Jane Greathouse to increase enforcement of the ordinance with more detailed reporting procedures and the use of independent audits if necessary. In separate action, the commissioners voted to allow Samuel Border to subdivide his nearly 15 acres on SR 15 southeast of Watkinsville to allow for sale of what was built as a tenant dwelling separately from the main house on the property. The commissioners took their action on the revised liquor ordinance after discussion among themselves and with county staff and comments from citizens. The deliberations lasted more than 45 minutes and focused on how to change the existing county ordinance allowing for the sale of beer and wine in restaurants to allow in addition for the sale of liquor by the drink. Voters approved that change on Nov. 4. Some of those who spoke advocated for changes in the percentages in the ordinance and the requirement that food be sold with alcoholic drinks and others spoke against those changes. John Wegel, 1020 Old Waverly Way, wanted to eliminate the requirement to sell food with alcohol and to change the percentage of food sales to one-third food. George Parrella, general manager at Taqueria Tsunami in Epps Bridge Centre, said he wasn’t concerned about the percentages but did want to eliminate the requirement to sell food with drinks. Frank Bishop, developer of Epps Bridge Centre, also wanted to eliminate the requirement to sell food with alcohol and wanted to raise the percentage of alcohol sales allowed to 30 or 35 percent. Bishop said he had a different view on that percentage than did Parrella. “In dealing with other tenants around the country, we get a request for ‘What are the ratio numbers?’ Thirty percent seems to be a threshold that is critical to them,” Bishop said. I spoke and asked that the percentages and service area be kept the same and that the requirement to sell food with alcoholic drinks be retained. I also asked that the county invest more effort in monitoring compliance with the ordinance. Bob Bishop, 1741 Experiment Station Road, spoke against a reduction of percentages and for keeping requirement to purchase food with alcohol. Bob Bishop also asked the BOC to require reporting by the restaurants to be “certified by a CPA,” or certified public accountant. The Board members discussed their views on the ordinance at the front of the meeting, with citizen input held up until almost 17 minutes into the discussion. Commissioner Mark Saxon said before hearing from the citizens that he wanted to drop the requirement that food be sold with drinks. BOC 1 6 15 liquor clip Saxon from Lee Becker on Vimeo. During those early comments Chairman Davis also raised the issue of the map that specifies where beer, wine and alcoholic beverages can be sold in restaurants. OCO: Davis On Map from Lee Becker on Vimeo. All four commissioners said they were content with the current map, though Saxon and Commissioner Bubber Wilkes said they expected to consider changes in that map in the future. Davis returned to the location of sales several times and asked B.R. White, director of the county’s Planning Department, to present a map that showed specific changes. The map, which White sent me today, extends the service area along SR 316 to the Barrow County Line, along a new section of Mars Hill Road, along a new section of Experiment Station Road, and along both sides of SR Loop 10 from Home Depot to U.S. 441. In the end, none of the other commissioners would agree to make any changes in the service area, and the ordinance passed unanimously. Davis votes only in the case of a tie. The new ordinance standardized the percentage of sales for recreational clubs and restaurants at 25 percent alcohol and eliminated the requirement that food be served with alcoholic drinks. The commissioners decided that the requirement for more detailed reporting will be handled administratively and did not write them into the ordinance. Parrella from Taqueria Tsunami asked the Board when the process of getting a license to sell liquor by the drink would begin. County Attorney Daniel Haygood told Parrella that the county ordinance would go into effect immediately and that applications could be made today. Angela Helwig, who is an administrative assistant in the county, told me late today that a representative of Taqueria Tsunami visited the Commission offices today and began the application process. County Clerk Jane Greathouse administers the application and licensing process for the county. The decision to allow Border to subdivide his property came after more than an hour of deliberation that involved attorneys representing Border and opponents of the zoning action. The issue has a long history, and the BOC denied a similar request by Border back in 2012. The 15 acres Border was seeking to divide are part of a subdivison consisting of 210 acres created in 1993. Border was seeking approval to administratively subdivide the property into two tracts, one of just less than five acres for the second house, with the remaining acreage for the original single-family dwelling. Most of the discussion last night focused on construction of a separate roadway that would serve the two dwellings but parallel an existing roadway that serves the other properties. At the center of the controversy is the second house. Oconee County Building Inspector Steve Hansford issued Border a building permit on Jan. 19, 2007, for a 1,500-square-foot-building as a “tenant farm dwelling.” This allowed Border to put a second dwelling on the property, under the restriction it was to be used for that purpose. On Dec. 10, 2008, Hansford issued a certificate of occupancy for that building. The permit specifies that the building was 1,500 square feet in size. According to the county tax records, the dwelling actually constructed is 2,676 square feet in size. The county has known from at least 2008 of the discrepancy. Allen Skinner, chief appraiser in the Oconee County Property Appraisal Department, told me in a telephone conversation today that his office listed the property at 2,676 square feet in size, with an attic and basement, in the first assessment on Jan. 1, 2008. The house was not completed, and it was valued at $106,000. A year later, when it was finished, according to Skinner, it was assessed at $230,000. Last year it was assessed at $240,304. Skinner said his office has access to the building permits for properties but does its own measurement in making its assessment. Commission Jim Luke made reference to this problem last night. “The county is not without blame,” he said. OCO: Luke On Border Rezone from Lee Becker on Vimeo. In the end, Commissioners John Daniell and Saxon joined Luke in supporting the rezone. Commissioner Wilkes voted against the rezone. The commissioners also voted to allow the withdraw of a rezone for a recreational vehicle storage facility at Union Church Road and New High Shoals Road and to postpone action on a rezone for a medical and office complex at Virgil Langford Road and Jennings Mill Road. The complete video of the discussion of the change in the county's liquor ordinance is below. BOC Chairman Davis introduces the agenda item and turns next to County Attorney Daniel Haygood, who discusses the details of the proposed ordinance. Commissioners, in order to Davis' right, are Luke, Daniell, Wilkes and Saxon. County Clerk Greathouse sits to Davis' left. To her left is County Administrative Officer Jeff Benko. 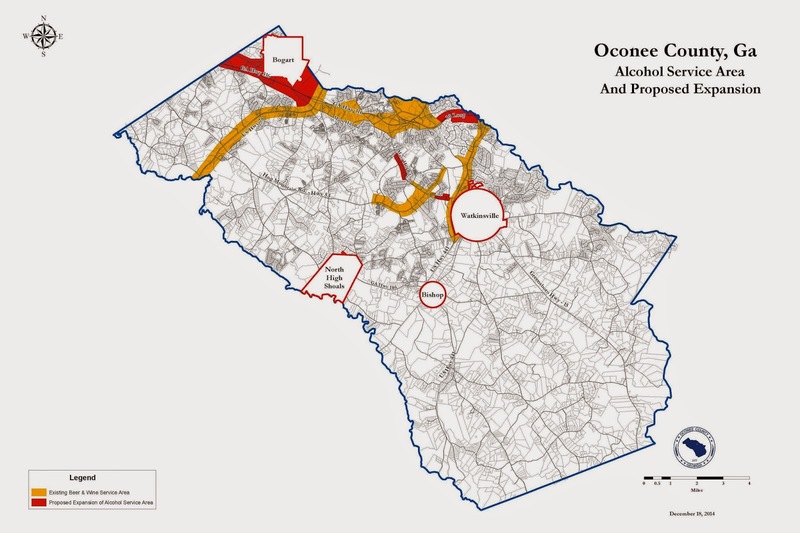 OCO: Oconee Liquor Ordinance from Lee Becker on Vimeo. Frank Bishop, developer of Epps Bridge Centre, also wanted to eliminate the requirement to sell food with alcohol and wanted to raise the percentage of alcohol sales allowed to 30 or 35 percent. Bishop said he had a different view on that percentage than did Parrella. Frank Bishop is a carpetbagger, an out of county developer who doesn't seem to give a flip about what Oconee will look like in 5, 10, 20 years. He runs to Melvin Davis everytime he wants something that financially benefits him, and Melvin is clearly willing to oblidge. Funny how Melvin never pushed all of these liquor changes for existing locally owned restaraunts. Who does Melvin Davis represent: Frank Bishop and Jamie Boswell, or the forty thousand plus people who actually live in Oconee County??? Separating food and alcohol sales clearly allows bars; these bars will just be in restaurants that also sell food. I suspect though that this is what most current county residents want.